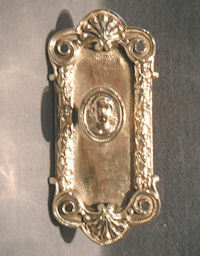 Original, quality late 19th century exterior cast brass bell pull. For use with a tight wire, non-electrical bell system. Other parts required to operate this system are usually available in stock and replacement rear springs and washers have been fitted and fully overhauled. 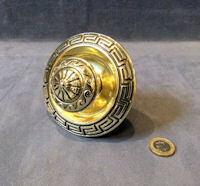 This example has a decorated spherical shaped central pull knob mounted in a dished circular backplate decorated to the outer rim with a Greek key pattern. Complete and in good and working order. Backplate 4" diam and knob 2" diam. Original, quality late 19th century exterior cast brass bell pull. For use with a tight wire, non-electrical bell system. Other parts required to operate this system are usually available in stock. A replacement rear spring and washers have been fitted and has been fully overhauled. 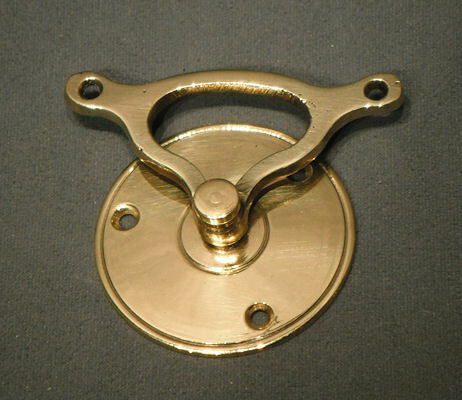 This example has a segmented shaped central pull knob mounted in a dished circular backplate. Complete and in good and working order. Backplate 4.5" diam and knob 1.5" diam. 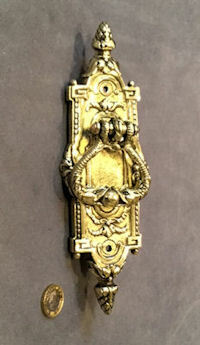 Original, quality late 19th century exterior brass bell pull. This example has a square faceplate with a deep dished recess and a central spherical shaped pull knob. The faceplate has four countersunk screw holes for mounting and the square bar has been fitted with a replacement spring. For use with a tight wire, non-electrical bell system. Other parts required to operate this system are usually available in stock. Many other bell fittings of differing types may also be available. Complete and in good and working order. Faceplate 5" x 5". 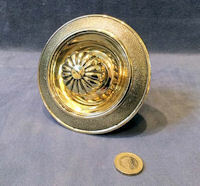 Recessed dish 1.5" deep x 3.5" diam. 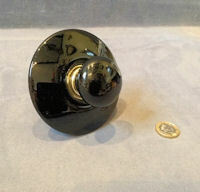 Original, quality late 19th century ceramic exterior bell pull with a black ceramic pull knob mounted with a matching ceramic circular backplate. For use with a tight wire, non-electrical bell system. Other parts required to operate this system are usually available in stock and a replacement rear spring and washer has been fitted. All is fully overhauled and complete and in good and working order. Backplate 4" diam, knob 1.5" diam and total front to back 1.75". Original, quality late 19th century extra large cast brass exterior bell pull. For use with a tight wire, non-electrical bell system. 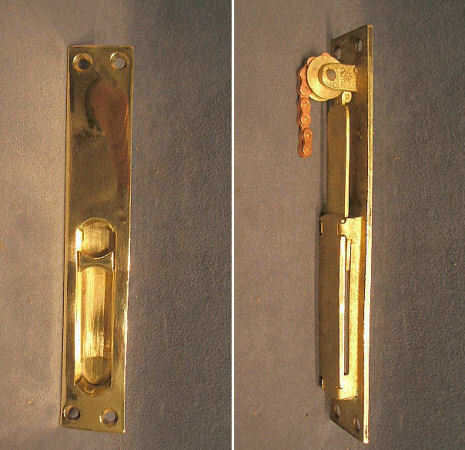 This most unusual example has a downwards pull 'T' bar handle mounted on a circular cast brass backplate with a concealed mounting plate with four countersunk screw holes for mounting. Other parts required to operate this system are usually available in stock and many other bell fittings of differing types may also be available. Has been fully overhauled and all is complete and in good and working order. Backplate 5.25" diam. Total 6.5" front to back exposed including 'T' handle. Total to be recessed 2.75" tall x 1" wide. Original, quality late 19th century, brass interior bell pull, with a gilt decorated white central boss and matching knob on the pull handle. For use with a tight wire, non-electrical bell system. Other parts required to operate this system are usually available in stock and many other bell fittings of differing types may also be available. 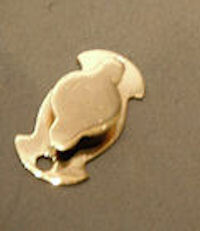 The brass has been polished and lacquered, although the lacquer may be removed at no extra cost. Fully overhauled and complete and in good and working order. Central boss 2.5" diam. Total 2.25" tall x 6" wide including handle and 0.75" to be recessed. 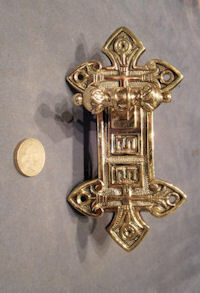 Original, quality late 19th century exterior brass bell pull of the Scottish form with a cast brass rectangular shaped backplate, with two countersunk screw holes for mounting and a shaped cast brass pull knob to the centre. For use with a tight wire, non-electrical bell system. Other parts required to operate this system are usually available in stock. Replacement rear spring and washers have been fitted and it has been overhauled and is complete and in good and working order. Backplate 4" x 3" x 0.5". Total 2" front to back exposed and 5" including length of bar recessed. Original, quality late 19th century cast brass interior bell pull with a beaded circular central brass boss and a matching grip to the pull handle, all mounted on decorative backplates with acanthus leaf designs. This example is for use with a tight wire, non-electrical bell system and other parts required to operate this system are usually available in stock. Polished and lacquered, although the lacquer may be removed at no extra cost. Fully overhauled and complete and in good and working order. 6" tall x 3.25" wide, 1.25" front to back exposed and 2.5" diam to be recessed 1.25". 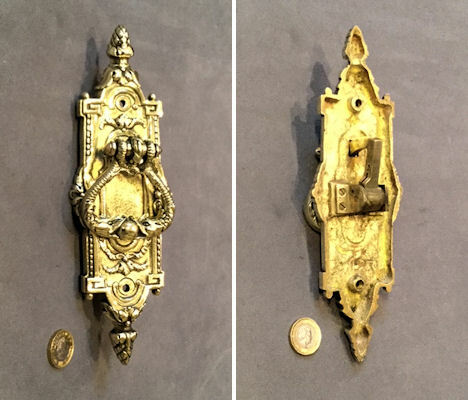 Original, quality late 19th century continental very decorative cast brass exterior bell pull, for use with a tight wire, non-electrical bell system. Other parts required to operate this system are usually available in stock. This super example has a pull out and down handle decorated with entwining fish of great detail and all is mounted on a vertical rectangular backplate with two screw holes for mounting and fir cone shaped finials. Fully overhauled and complete and in good and working order. Backplate 8.5" tall x 2.75" wide. Total 1.25" front to back and 1.25" x 1" to be recessed 2" deep. 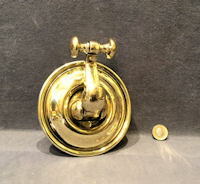 Original, quality late 19th century cast brass exterior bell pull, for use with a tight wire, non-electrical bell system. Other parts required to operate this system are usually available in stock and many other bell fittings of differing types may well be available. This super example has a ' T ' bar grip to the centre and a gothic shaped backplate, with four countersunk screw holes for mounting. All has been fully overhauled, is complete and in good and working order. Backplate 6" x 3" and 1.75" exposed. Recessed 2.75" x 0.75" x 2.25" deep. 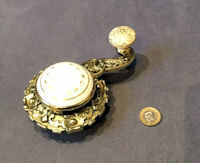 Original, quality late 19th century, cast brass exterior bell pull for use with a tight wire, non-electrical bell system. Other parts required to operate this system are usually available in stock and many other bell fittings of differing types may well be available. 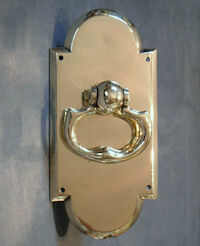 This unusual example has a ' gothic ' style cast brass backplate, with a central ropetwist ring pull handle. A replacement spring has been made to suit and fitted to the reverse and all is complete and in good and working order. Backplate 6.25" x 2.25" and 1.5" exposed front to back. 1" wide x 2" tall to be recessed 2"deep. Original, quality late 19th century, brass interior bell pull, with a ceramic central boss and pull handle grip. For use with a tight wire, non-electrical bell system. Other parts required to operate this system are usually available in stock and many other bell fittings of differing types may well be available. 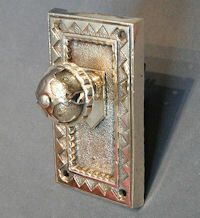 This super example has a wood grained finish to the ceramic mounts and ' gothic ' style brass pull handle and backplate. Although the main ceramic boss is cracked, all is complete and in good and working order otherwise. Central boss 2.5" diam, total 6.5" tall, 4" wide and 1" to be recessed. 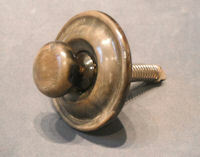 Original, quality unused late 19th century cast iron exterior bell pull in the original bronzed lacquer finish. The spherical shaped pull knob is mounted within a circular dished backplate with a pierced outer frame. This example is impressed to the exterior of the dish for the manufacturer "A Kenrick and Son"of West Bromwich. For use with a tight wire, non electric bell system and other parts required to operate this system are usually available in stock and many other bell fittings of differing types may well be available. Replacement rear spring and washers have been fitted. All is complete and in good and working order. Outer frame 6" diameter, knob 2" total to be recessed, 3" diam bowl and 2" front to back. 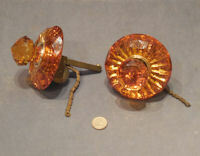 Pair of original, quality, late 19th century, superb interior bell pulls with amber coloured glass circular backplates and pull knobs, all with circular brass collars, steel plates to the reverse and brass mounting fittings. This is the first we have seen of this model and is for use with a tight wire, non-electrical bell system. Other parts required to operate this system are usually available in stock and many other bell fittings of differing types may also be available. Fully overhauled, in superb condition, not a chip or crack in sight and complete and in good and working order. Backplates 4" diameter, knob 1.75" diameter, total on view 2.5" front to back. Original, quality, late 19th century, cast pink brass exterior bell pull for use with a tight wire, non-electrical bell system. Replacement rear spring and washer have been fitted. Other parts required to operate this system are usually available in stock and many other bell fittings of differing types may also be available. This example has very detailed embossed decorations of acanthus leaves to both the backplate and pull knob. The diamond shaped backplate has three screw holes for mounting and all has been fully overhauled, polished and is complete and in good and working order. Backplate 3.25" x 3.25", knob 1.75" diameter and 2.25" front to back. Original, quality, late 19th century, cast brass exterior bell pull, for use with a tight wire, non-electrical bell system. 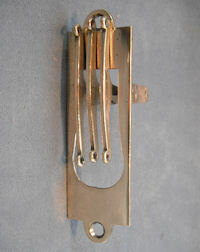 This example has a central pull out and down period ring handled, shaped grip, mounted on a shaped vertical backplate with four screw holes. All has been fully overhauled and is complete and in good and working order. Backplate 7.5" x 3.75", exterior front to back 1.5", to be recessed 3" x 1.5" and 3" front to back. 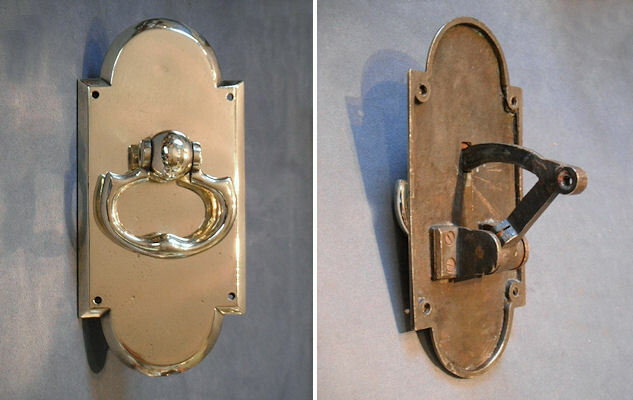 Original, quality, late 19th century, cast brass exterior bell pull lever, with a shaped rectangular backplate with two countersunk screw holes for mounting and a 'T' bar, pull down handle. The backplate is decorated in the aesthetic movement style. For use with a tight wire, non-electrical bell system. Other parts required to operate this system are usually available in stock and many other bell fittings of differing types may also be available. A replacement rear spring has been fitted, all has been fully overhauled and is complete and in good and working order. Backplate 6.25" x 2.25" front to back exposed and 2" x 1.5" and 0.5" to be recessed. Original, quality, late 19th century, cast brass interior bell pull, for use with a tight wire, non-electrical bell system. Other parts required to operate this system are usually available in stock. This serious heavy example has a circular backplate in the front of a laurel wreath, a cranked side handle, with a mythical beast's head and a central boss, with a central "V" on a shield motif. Good repairs to the hidden cast iron section and all has been fully overhauled, polished and lacquered, although the lacquer may be removed at no extra cost. Complete and in good and working order. Backplate 4" diameter, central boss 2.5" diameter. Original, quality, late 19th century, cast brass exterior bell pull, for use with a tight wire, non-electrical bell system. Other parts required to operate this system are usually available in stock. This rectangular shaped example has a border of laurel leaves to the sides, a shell shape to the top and bottom and four countersunk screw holes for mounting. The oval pull out knob to the centre has a portrail of a head in relief. Fully overhauled, with replacement rear springs have been fitted and is now complete and in good and working order. Backplate 7" x 3.25" wide, total 1.5" front to back, 3" and 2.5" deep to be recessed. Original, quality, late 19th century, cast brass exterior bell pull, for use with a tight wire, non-electrical bell system. Other parts required to operate this system and other bell fittings of differing types are usually available. The shaped pull knob is decorated with matching designs to the rectangular shaped backplate and the arm is impressed "T.P and S" to the reverse. The backplate has four countersunk screw holes for mounting, all has been fully overhauled and is complete and in good and working order. Backplate 5.5" x 3", knob 1.75" diameter, total 2.25" front to back when mounted and 2.5" to be recessed for the arm. Original, quality, late 19th century, brass and amber coloured glass interior bell pull, for use with a tight wire, non-electrical bell system. Other parts required to operate this system are usually available in stock and many other bell fittings of differing types may also be available. 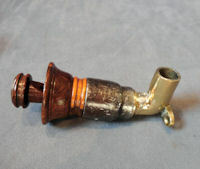 This example has a heavy cast brass bead pattern, with amber coloured glass mounts to the centre and to the side handle grip. The brass has been polished and lacquered, although the lacquer may be removed at no extra cost and all is complete and in good and working order. A much grander bell pull than normally found. Backplate 3.25" diameter, 6.25" wide including handle, 2.5" x 1" to be recessed. Original, quality, late 19th century, interior bell pull, most unusual in 'cowhorn'. This pull is for use with a tight wire, non-electrical bell system and other parts required to operate this system are usually available in stock. 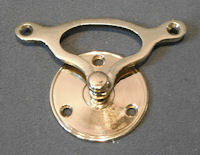 This example has the spherical pull knob mounted within the circular turned horn backplate and fitted with replacement rear spring and washers. All has been fully overhauled and is complete and in good and working order. Backplate 3.5" diameter, pull knob 1.5" diameter, 1.75" front to back. 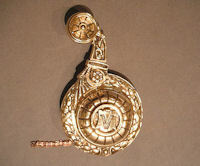 Original, quality, late 19th century, brass interior bell pull for use with a tight wire, non-electrical bell system. Other parts required to operate this system are usually available in stock. This example has Aesthetic Movement designs overall, with a part reeded central boss and matching grip to the side handle. Polished and lacquered, although the lacquer may be removed at no extra cost. Complete and in good and working order. Another first for us of this model. Backplate 4.5" x 5.5" wide including lever handle and 1" to be recessed. 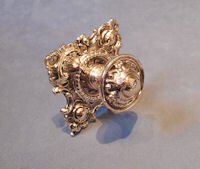 Original, quality, late 19th century, cast brass exterior bell pull, with a circular dished backplate with a shaped outer decoration and a central pull knob, with a gothic design in raised detail. For use with a tight wire, non-electrical bell system, other parts required to operate this system are usually available in stock. A replacement rear spring and washer has been fitted and all has been fully overhauled. Complete and in good and working order. Backplate 4.75" and 1" front to back and 0.75" to be recessed. 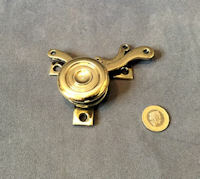 Original, quality, circa 1900, cast brass, interior bell pull for use with a tight wire, non-electrical bell system. Other parts required to operate this system are usually available in stock. This example has a square backplate engraved with a decorative border and an oval shaped central boss with matching knob to the handle. Polished, lacquered, although the lacquer may be removed if required at no extra cost. Complete and in good and working order. An unusual example. Backplate 3" square, longest 5", 2" front to back and 1" to be recessed. 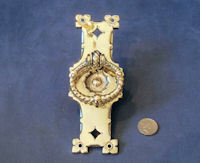 Original, quality, late 19th century, very large cast brass continental exterior bell pull. For use with a tight wire non-electrical bell system. The other parts required to operate this system are usually available in stock. The heavy, squared drop ring, pull handle is mounted with a ball backplate onto a shaped flat backplate. Has been fully overhauled and is complete and in good and working order. The main backplate has four countersunk screw holes for mounting. 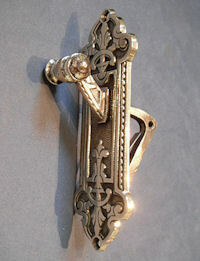 A superb very unusual bellpull. Backplate 10" x 7" and 1.5" front to back. To be recessed 3" x 1" x 1". 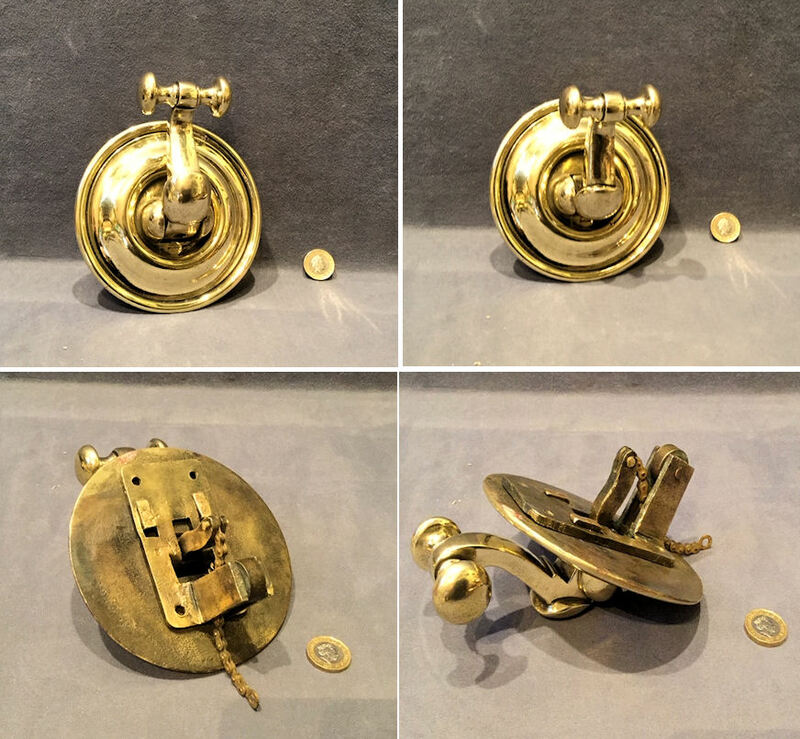 Original, quality, brass exterior bell pull, fashioned using an original early 19th century brass knob, with a replacement bar, spring and oval shaped backplate made to suit. The backplate has two countersunk screw holes for mounting and all has been polished and lacquered and is compete and in good and working order. Backplate 2.75" x 1.5", knob 1.5" x 1.75" front to back. Price is for each. Original quality, late 19th century, cast brass recessed interior bell pull of an unusual form, it appears to be a recessed door bolt, but it is for an interior indicator bell. For use with a tight wire, non electrical, bell system. The other parts required to operate this bell system are usually available in stock. The faceplate has four countersunk screw holes for mounting. All is complete and in good and working order. Backplate 7" x 1.25" and 1" to be recessed. Original, quality late 19th century cast brass fitting for use with a tight wire, non-electrical bell system. This example is sprung to assist the bell pull returning to the position required. The central boss is a replacement made to suit, but all the rest is original. Fully overhauled, polished and lacquered and complete and in good and working order. 3.5" x 2.5" + 1" front to back. Original, quality late 19th century cast brass fitting for use with a tight wire, non-electrical bell system. This example is sprung to assist the bell pull returning to the position required. The central boss is a replacement made to suit, but all the rest is original. Fully overhauled, polished and lacquered and complete and in good and working order. 4" x 3" x 1" front to back. Price is for each. Original, quality late 19th century cast brass fitting for use with a tight wire, non-electrical bell system. This example is sprung to assist the bell pull returning to the position required. The central boss is a replacement made to suit, but all the rest is original. Fully overhauled, polished and lacquered and complete and in good and working order. 4" x 3" + 1" front to back. 1.75" diam central disc. 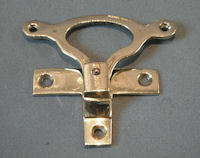 Original, quality late 19th century decorative brass grip for an interior tapestry type bell pull. For use with a tight wire, non-electrical bell system. Other parts required to operate this system are usually available in stock. This super example has a circular medallion, embossed with the head and face of a lion both sides and a ring pull grip underneath. This grip has the heads of two eagles one to each side. 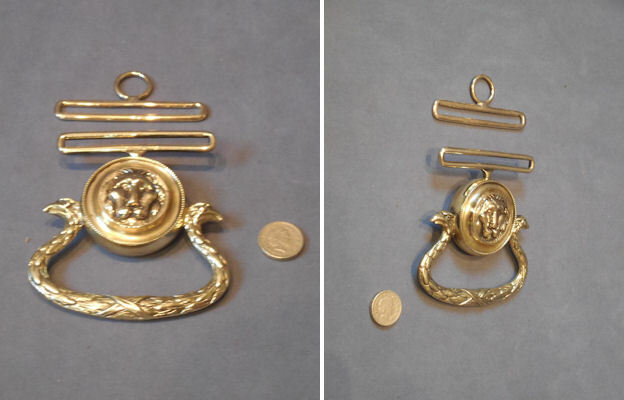 The top of the lion medallion is fitted with the wide loop mount to take the cloth 'banner' pull and matching wide brass loop is also included to fit to the wire at the top. All has been polished and lacquered, although the lacquer may be removed at no extra cost and is complete and in good and working order. 4.25" tall, 3.75" wide and slot for material 3". 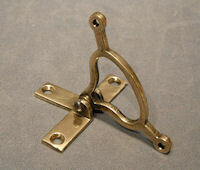 Original, quality, 19th century, cast brass fitting, for use with a tight wire, non-electrical bell system. This example will make a turn through a corner for one wire. Each side has two countersunk screw holes for mounting. Polished and lacquered, although the lacquer may be removed a no extra cost. Complete and in good and working order. Each 3.75" x 1.5". Price is for each. 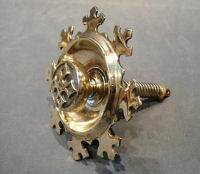 Original, quality, 19th century, cast brass fitting for use with a tight wire, non-electrical bell system. This example will make a turn through a corner for up to two bell wires, but it could be used for just one if only one bell is fitted. Polished and lacquered, although the lacquer may be removed at no extra cost. Complete and in good and working order. Backplate 3" x 1.25" each side and 1.5" to be recessed. 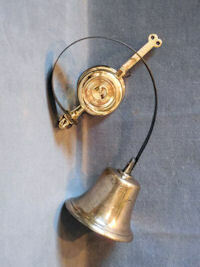 Original, quality, 19th century, cast brass bell fitting for use use with a tight wire, non-electrical bell system. This example will make a 45 degree turn for up to three bell wires after passing through a wall. One could use just the one pulley if only one bell is fitted. Polished and lacquered, although the lacquer may be removed at no extra cost. Complete and in good and working order. Backplate 5" x 1.5" and 1.5" x 1.5" to be recessed. Quality, surface wall mounted, pulley wheel, for use with a tight wire, non-electrical bell system. 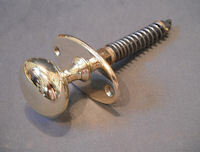 This fitting has been made to suit, copied from an original and is used to change direction on a flat wall. 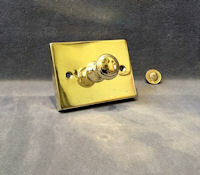 The backplate has two countersunk screw holes for mounting and has been polished and lacquered, although the lacquer may be removed at no extra cost. Complete and in good and working order. Backplate 2" x 1" x 3/8". Price is for each. 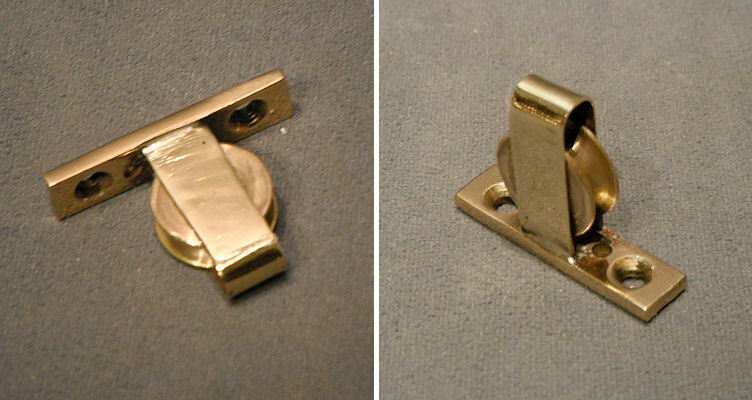 Original, quality brass, surface wall mounted, pulley wheel for use with a tight wire, non-electrical bell system. This is a replacement made to suit and sometimes will have an original wheel. This fitting is used to change direction of the wire into or around a corner. The backplate has two countersunk screw holes and has been polished and lacquered, although the lacquer may be removed at no extra cost. Backplate 1.75" x 0.5", total 1.25" front to back. Price is for each. Original, quality, late 19th century, cast brass, surface wall mounted, crank fitting, for use with a tight wire, non-electrical bell system. This fitting is used to change direction flat on the wall, and would normally be mounted as in the picture. Polished and lacquered, although the lacquer may be removed at no extra cost. Backplate 2.5" x 1.75", total 3.25" x 3" + 0.75" front to back. Price is for each. Original, quality, late 19th century, cast brass, surface wall mounted, crank fitting for use with a tight wire, non-electrical bell system. This fitting is used to change direction on a flat wall and would normally be mounted as the picture. The backplate has three countersunk screw holes for mounting and two eyes to connect the wire to. Polished and lacquered, although the lacquer may be removed at no extra cost. The backplate is a replacement made to suit and copied from an original. Complete and in good and working order. Backplate 1.75" diameter, 3" widest x 2.5" tall + 0.75" front to back. Price is for each. Original, quality, late 19th century, cast brass, surface wall mounted, crank fitting for use with a tight wire, non-electrical bell system. This fitting is used to turn the wire around a corner. The backplate has three countersunk screw holes for mounting and the fitting has two eyes to connect the wire to. Polished and lacquered, although the lacquer may be removed if required at no extra cost. Complete and in good and working order. Backplate 2.75" x 1.5", total 2.5" x 2.5". Price is for each. Original, quality, late 19th century, cast brass, surface wall mounted, crank fitting for use with a tight wire, non-electrical bell system. This fitting is used to change direction on a flat wall and would normally be mounted as the picture. The backplate has three countersunk screw holes for mounting and two eyes to connect the wire to. Polished and lacquered, although the lacquer may be removed if required at no extra cost. The backplate is a replacement made to suit and copied from an original. Complete and in good and working order. Backplate 2.25", total 3" x 2.5". Price is for each. 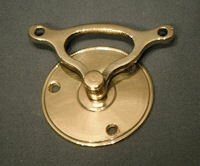 Quality, brass surface wall mounted pulley wheel, for use with a tight wire, non-electrical bell system. This is a replacement made to suit and sometimes will have used an original wheel. This fitting is used to change direction to up or down, having passed through a wall from say an exterior bell pull, to change direction under a ceiling, beam or inside a corner. The backplate has two countersunk screw holes for mounting and one for the wire, if required. Polished and lacquered, although the lacquer may be removed if required at no extra cost. Complete and in good and working order. Backplate 1.5" x 0.25" x 1.25". Price is for each. 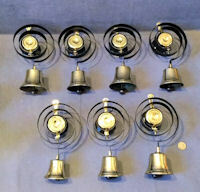 Original, quality set of seven matching late 19th century servants intercom bells with brass mounts steel springs and a decorative central brass boss. For use with a tight wire, non-electrical bell system and can be pulled from either left or right. Other parts required to operate this system are usually available in stock and many other bell fittings of differing types may also be available. Often now referred to as 'Downton Abbey' bells. 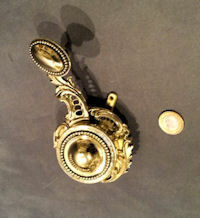 Three of the brass central bosses are replacements made to match, otherwise all is original. The ironwork has been repainted, and the brass polished and lacquered, although the lacquer may be removed at no extra cost. Fully overhauled and complete and in good and working order. Tallest 9.5" x 5" wide x 3" front to back. Bell mouths 2.75" to 3.5" diam. 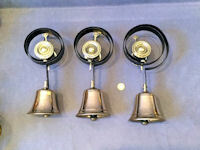 Original, quality set of three matching late 19th century servants intercom bells with brass mounts steel springs, brass clappers and decorative central brass bosses. For use with a tight wire, non-electrical bell system and can be pulled from either left or right. Often now referred to as 'Downton Abbey' bells. Other parts required to operate this system are usually available in stock and many other bell fittings of differing types may also be available. The ironwork has been repainted, and the brass polished and lacquered, although the lacquer may be removed at no extra cost. Fully overhauled and complete and in good and working order. These threes bells are well above average in quality and form and complete and in good and working order. 11" tall and 4.5" to 5.25 wide + bell mouths 4.5" and 4.5" front to back. 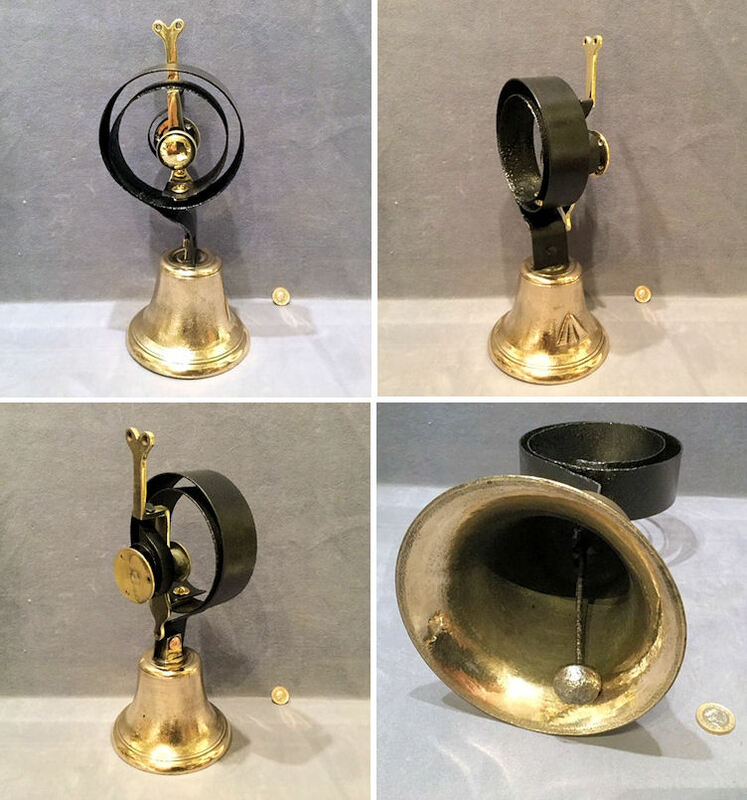 Original, quality late 19th century brass intercom bell with brass mounts, steel springs and a decorative central brass boss. The bell is impressed "10". For use with a tight wire, non-electrical bell system and can be pulled from either left or right. Other parts required to operate this system are usually available in stock. The mounting plate, rear spring and central boss are replacements, copied from an original and have been made to suit. Often now referred to as 'Downton Abbey' bells. The ironwork has been cleaned and repainted black and the brass polished and lacquered, although the lacquer may be removed at no extra cost. Fully overhauled and all is complete and in good and working order. 10" tall x 4.25" wide and 3.5" front to back. Bell mouth 3.5". 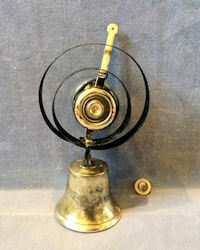 Original, quality late 19th century brass intercom bell with brass mounts, steel springs and a decorative central brass boss. Often now referred to as 'Downton Abbey' bells. 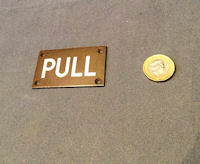 Can be pulled from either left or right. For use with a tight wire, non-electrical bell system and other parts required to operate this system are usually available in stock. Many other bell fittings of differing types may also be available. The mounting plate, rear spring and central boss are replacements, copied from an original and have been made to suit. The ironwork has been repainted, and the brass polished and lacquered and all complete and in good and working order. 10" tall x 4.5" wide and 4.5" front to back + bell mouth 3.25". 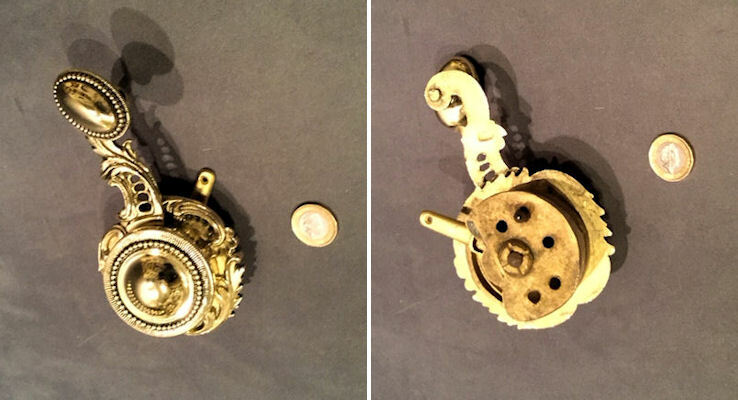 Original, quality late 19th century brass intercom bell with brass mounts, steel springs and a decorative central brass boss. Often now referred to as 'Downton Abbey' bells. Can be pulled from either left or right. For use with a tight wire, non-electrical bell system and other parts required to operate this system are usually available in stock. Many other bell fittings of differing types may also be available. 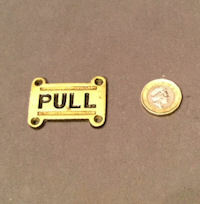 The mounting plate, rear spring and central boss are replacements, copied from an original and have been made to suit. The ironwork has been repainted, and the brass polished and lacquered and all complete and in good and working order. 9.5" tall x 5.25" wide and 3.5" front to back + bell mouth 3.75". 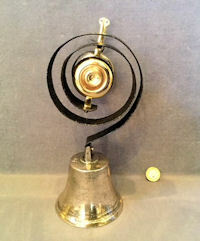 Original, quality late 19th century brass intercom bell with brass mounts, steel springs and a decorative central brass boss. Can be pulled from either left or right, for use with a tight wire, non-electrical bell system. Other parts required to operate this system are usually available in stock. The central boss and mounting plate are replacements made to suit, copied from an original. Often now referred to as 'Downton Abbey' bells. The ironwork has been repainted, and the brass polished and lacquered, although the lacquer may be removed at no extra cost and is complete and in good and working order. The top of the bell is engraved "16". Other similar bells may be available on request. 10" tall x 5" wide and 4.5" front to back plus bell mouth 3.75". 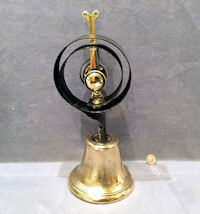 Original, quality late 19th century brass intercom bell, with brass mounts, steel springs and a decorative central brass boss. Often now referred to as 'Downton Abbey' bells. Can be pulled from either left or right. For use with a tight wire, non-electrical bell system and other parts required to operate this system are usually available in stock. Many other bell fittings of differing types and other similar bells may be available on request. 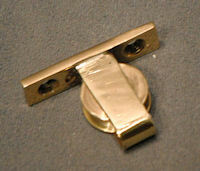 The central brass boss is a replacement copied from an original. The ironwork has been repainted and the brass polished and lacquered, all fully overhauled and complete and in good and working order. 10" tall, 6" wide, 4.5" front to back and 3.75" width of bell mouth. Original, quality 1920's rectangular shaped brass plaque in the original unpolished finish with "Pull" in upper case inlaid in white enamel. This example has four countersunk screw holes for mounting and can be polished to a shiny pink brass finish if required at no extra cost. Complete and in good order. 2.5" x 1.5". 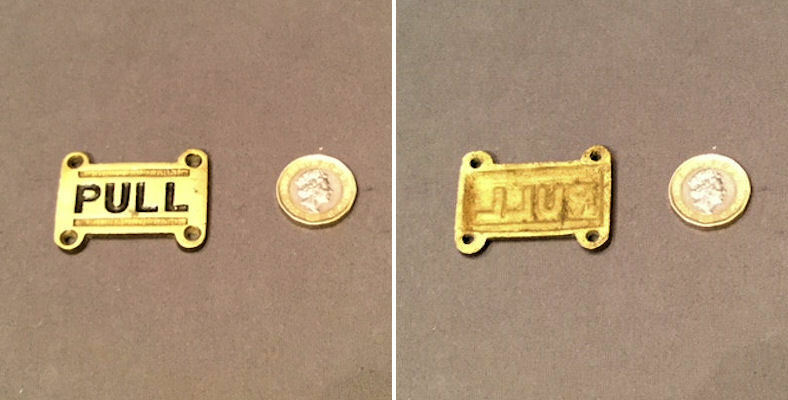 Original, quality late 19th century cast brass rectangular shaped "Pull" plates, each with four countersunk screw holes for mounting and all in the original unpolished finish. 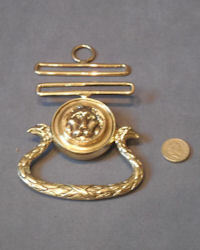 Can be polished to a shiny brass on request for no extra charge. Complete and in good order. 1.75" x 1.25". Price is for each.